In earlier blog posts, I said I was going to start writing medical romances and submit them to Harlequin. Well, I submitted The Heartbalm Effect to Harlequin Medical Romance on July 14, 2016, and despite the fact that the version I sent them became corrupted, and I saved it as a docx file, and then re-submitted it, I have yet to hear back from Harlequin, so I thought what the hell, I’m going to release The Heartbalm Effect on my own!!!!! I haven’t released anything new since I released Trailer Park Wives Part III as an ebook (on February 13, 2017), and as a paperback novel (on February 20, 2017), and so I decided to just release The Heartbalm Effect and get it out there. I also got to play with my website again, something that I haven’t done in quite some time, and it was a lot of fun, because I’m adding a category called Medical Romances, and I had to fidget with the menus and my pages and make the edits work out just right. I hired Dawn of Dawn Austenworks to design my website, and I’m so glad I did, because Dawn made my writer website look lovely and professional. In other news . . . I finished an acting gig with Dodging the Bullet’s Josh Phillips and Josh Luckett. I needed to re-film my scene as the redneck mama, because one of the actors quit after my scene was originally filmed, and we had to re-film. But Josh Luckett, who’s been working on Strangers 2, and conferring with the director, has added some new filming techniques to his style, and I believe that my performance–my command performance as redneck mama–is much better than the scene I filmed originally. I can hardly wait till the film comes out! The photo you see is me in full costume and makeup on the day I re-filmed my scene as Redneck Mama in Dodging the Bullet. 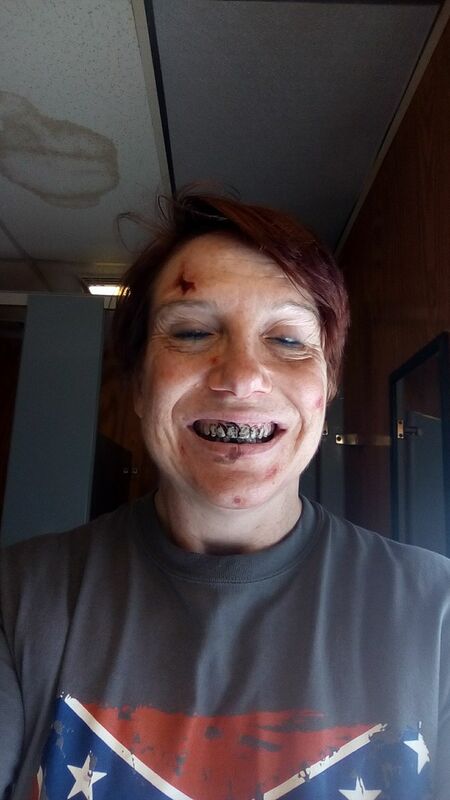 The makeup lady, the very talented Ashley Panzeca, had me dry my teeth, and then she applied this pasty substance that made my teeth look black! When the filming ended, I easily brushed the black tar off my teeth with toothpaste. It’s been a frustrating week, waiting for people to get back to me on various matters, and so when I decided to release The Heartbalm Effect on my own, it was such a cathartic experience, you wouldn’t believe!